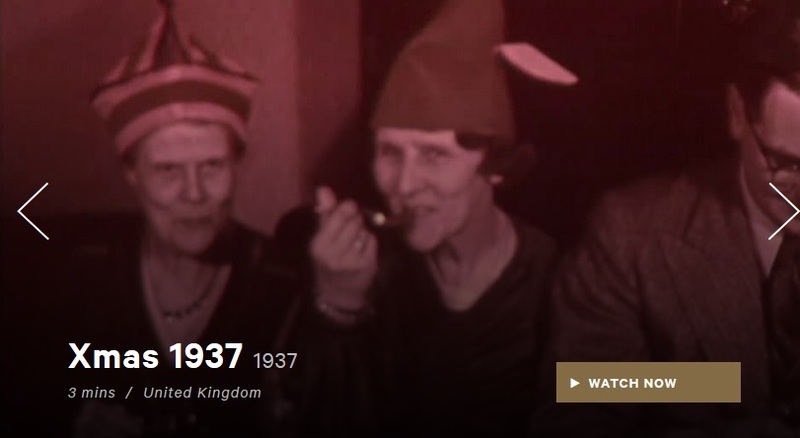 I spent my afternoon watching Christmas family home movies from the British Film Institute’s newly expanded archive player. Not much happens in any of the films and the absence of sound adds a rather surreal feel. The people featured are not named. We can only guess at their ages and what they are saying. They are all clearly aware of the camera but they are also carrying on pretty much as normal. Everyone gives and receive presents, they eat meals and play games and most people laugh and mess around a bit. There are some nice shots of living spaces, furniture and seasonal decorations and some touching hugs and thank you kisses. It’s all very ordinary. Although Christmas is the most unusual day of the year, some of what makes it special is just doing everyday things with the people you love. Some of the films come from the same family and watching them in order allows you to see fashions in dress and furnishings evolve, adults age and lose their hair, and their young children grow into teenagers. A slightly grumpy looking grandfather appears in the first of the sequence but not in any of the subsequent ones. By the last one, his wife is in a wheelchair and looking frail. Christmas always reminds people of the passage of time but these films actually chart it, in all it sadness and joys. There has been much talk online recently about the need for radical histories that challenge and confront the present. That is, of course, important but so too is history that is more mundane because, for most people throughout history, daily life has been just that. People eat, drink, sleep, travel, work and play. They love and they lose. Histories of such things do not have to have a political relevance, a challenge or a lesson for the present. But they can remind us that the past, like the present, is about real people. As historians we make people into numbers, categories and classifications but they are still are individuals too and watching them celebrate Christmas is a vivid reminder of that. My book Christmas and the British: A Modern History will be published by Bloomsbury Academic in 2016.